When you create a new customer experience, somebody needs to try it out and see if it’s easy for your customers. Great customer service goes hand-in-hand with corporate culture. Experiential marketing helps customers understand your value by trying it for themselves. Dan’s gas station has a partnership with his grocery store, Jewel, where for every $100 you spend at the grocery store you get 10 cents off at the pump. He registered for the program, but when he went to redeem it, he was presented with three multiple-choice screens. Which of these options would you choose (he has never received a rewards card)? Again, Dan signed up for a rewards program but didn’t ever receive a card. It turns out the “Alt ID” means, in some other language, your phone number. A customer is much more likely to remember their phone number than they are to be carrying some random rewards card, so why isn’t this just an option on the first screen? When you build a new experience, whether it’s digital or in the real world, you have to have someone try it out before you release it to the public. Rewards programs are meant to promote loyalty, but if you make the experience difficult it might create the opposite effect, so when in doubt make it easy for your customer. Why do you need a customer-focused culture? How do you build that culture? How do you change your organization to align everything with that customer-focused culture? We talk to Jeff about his book, his favorite passages from it, and go over our takeaways as well. Great customer service has to be ingrained in the corporate culture. You need to take the time to define your culture and set specific goals around it. Hire and train to your service culture, and then empower people to deliver on it. In “What a Nice Scotch Can Teach You About Experiential Marketing” by John Hall of Influence and Co, he starts with this insight: “You can’t just tell customers how great your candles smell or how comfy your mattress pad feels. Customers need to be able to interact with them in person to feel compelled to buy.” He takes a look at how the alcohol industry is particularly strong at creating experiential marketing events that create experiences out of tastings and turn them into must-attend events. The more immersive that a brand can make a brand experience, the more likely a customer is to remember it and buy. The more immersive that a brand can make the marketing experience, the more likely a customer is to remember it and buy. The customer experience starts before someone actually becomes a customer. 61% of employees would rather start their own business than work for someone else, according to Oracle’s “Sleepless Over Customer Experience” report. What this means is that companies need to spend time thinking about the employee experience, because ultimately if they’re happy they’ll make your customers happy, too. Happy employees are the easiest way to make sure you have happy customers. What Can A Nice Scotch Teach You About Experiential Marketing? Dan Gingiss: Get ready for another episode of the Experience This! Show. Join us as we discuss a gas rewards program that could leave you a little gassy. How to create the ultimate service culture, and why alcohol companies have figured out that tasting is believing. Gas, culture, and hooch. Oh my! We love telling stories and sharing key insights you can implement or avoid, based on our experiences. Can you believe that this just happened? So, there's this rewards program between my local grocery store, which is called Jewel-Osco and the local gas station, which is called Shell. You've probably heard of them. And basically, the way the program works is that for every $100 you spend at the grocery store, you get 10 cents off of gas at the pump. Dan Gingiss: Nice. Pretty nice. Dan Gingiss: Only problem is that redeeming that reward can be a little tricky. Now, I know that we use other segments to quiz each other on stuff, but if you bear with me, I'm going to give you a little quiz here. So, imagine you drive up the gas station and you get out of the car, you go over to the screen. And what you see is swipe easy rewards or easy pay card now. And there are also three choices that are each attached to the button. And one of them says credit. And one of them says debit. And one of them says rewards. 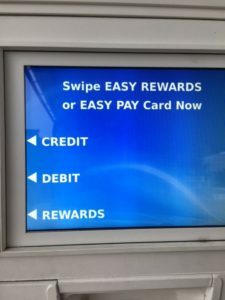 Now, hint hint, you don't actually have an easy rewards or easy pay card, nor do you know what that is, so you're going to choose one of those three buttons, credit, debit or rewards. Which do you think that you would do to enter your rewards card? Joey Coleman: I'm going to go with the aptly and hopefully appropriately named rewards button. Dan Gingiss: Ding ding ding ding ding. Fantastic, Joe. Dan Gingiss: You are one [crosstalk 00:01:49] You've cleared the first round. Dan Gingiss: Okay, so now you get to a screen, and by the way, listeners, we're going to post all these screens on our show notes at experiencethisshow.com, so you can see them afterwards. The next screen you get to says select reward, and again, you have three buttons to choose from. One of them says rewards, one of them says Jewel ID/FR, and the third one says cancel. Joey Coleman: Well, I did spend some time learning some tricks of multiple choice questions. So, I'm going to presume that it is not cancel, so I'm going to try to narrow my field to two. What the hell does Jewel ID/FR mean? Dan Gingiss: Absolutely no idea, but remember that my grocery store is jewel. 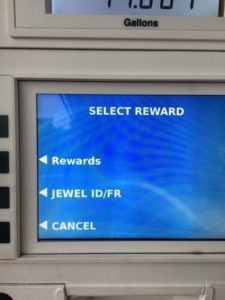 Joey Coleman: Okay, so, on one hand, I might be inclined to click on that, but I don't know what the Jewel ID/FR is, and the other button says rewards? Joey Coleman: I will go for rewards. It's my number two, because we're trying to get a reward here. Dan Gingiss: Alright, well it turns out that is the right answer. I still don't know what Jewel ID/FR means, but alright, so, we hit rewards. Joey Coleman: Woo-hoo! We get to live another day! Dan Gingiss: Awesome. And now it says at the top of the screen, insert rewards card. We've already identified that we don't have a rewards card. And there's three choices once again. Joey Coleman: Just to be clear, we don't have the rewards card on us? But we're signed up for some type of rewards program, is that right? Dan Gingiss: So, there are three choices again. One of them is cancel. And the other two are alt ID, or manual entry/barcode. Joey Coleman: Wow. So, again, I'm going to avoid cancel. Barcode. I'm guessing that's asking me to type in the barcode that's on the rewards card that I don't have, but why would I even want to type that in, anyway? 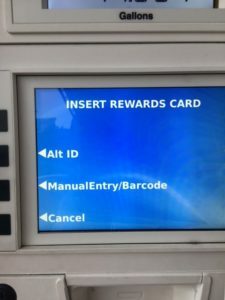 Dan Gingiss: And do you have any idea what an alt ID is? Joey Coleman: I mean, I presume it refers to alternative ID, but in this context, I have no idea what my alternative ID would be. Dan Gingiss: Well, it turns out, Joey, I'm not even going to have you guess on this one, because this is kind of unfair, but it turns out that alt ID actually means, in some other language, your phone number. Joey Coleman: Ah, there you go. Okay, well, someone makes sense, but why the hell did they say alt ID instead of just saying phone number? Dan Gingiss: I have no idea. In fact, they probably could've said that on the first screen, enter your phone number, and you've would've gotten immediately to where you have to go. Joey Coleman: Yeah, right out of the blocks. Not to mention, I would imagine in our increasingly text friendly world, most brands would probably want to know your phone number, because the phone number you're going to enter is a mobile number, not a landline. And so, then they can text message and promote you when you do some geo fencing and things like that when you're close. It blows my mind. Why not just say phone number? Especially because you've said the other said manual entry/barcode? Joey Coleman: So, that's enough characters to write phone number. That's the thing, there was a part of me that was like, "Well, maybe they only have six characters, so they can't do phone number." But technically you could do phone number without a space, if you just use the little hash, but long story short, it sounds like they really have no desire to make this easy on their customers. Joey Coleman: Wow, that was good math there. Dan Gingiss: Two by two, right? Joey Coleman: Ladies and gentlemen, Dan Gingiss. Dan Gingiss: I can tell you that not only have I gone through all four of those paths, I've gone through them multiple times, because it took a while for me to remember which was the right one. And this is one of those things that you and I talk a lot about, making a requirement remarkable, or about doing simple better, and this really isn't that hard. All that has to happen is I have to enter in my phone number and I get these rewards, that's it. Why does it take three screens to do that? 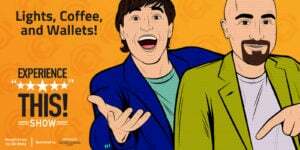 Joey Coleman: Yeah, I think the big challenge is, and this applies to anybody who's listening who has employees working on a customer experience that they aren't actually customers of. I have to imagine this was coded, and I say this respectfully, because I know a lot of coders. Heck, I married one. That it was done by a coder who never tried to use it to get gas rewards. Dan Gingiss: Who doesn't have a car. Joey Coleman: Yeah. You know what I mean. And so, it's like if you've never had the experience, how do you know how to do it? And I'm sure that on the backend there's some reason for, well, I'm not sure actually. There might be some reason for having to be a three screen gauntlet run, but I agree with you, why not just when you roll up, say enter your phone number? Like, right out of the blocks. Or at the very least, if you hit rewards, that should be the next screen, because nobody carries those plastic cards around. Even though they make the little one for your key chain, that's not going to fit in the little scanner. Joey Coleman: And then you're going to have to read the barcode off the back of that. Does the plastic card come with a magnifying glass? Dan Gingiss: I have no idea. And so, look, let's not beat a dead horse here, because the answer here is really not that hard. So, a few takeaways. You mentioned one of them. When you build a new experience, whether it's digital or in the real world, you have to have somebody actually try it out before you release it to the public. And it seems to me that that probably didn't happen here, because I think anybody off the street that would've looked at this would have said this is not as straight forward as it could be. You might want to go a step further and actually survey some of your customers, or bring in a focus group to try it out, and ask them about it so that you get that feedback. And this is a really basic user experience that was missed here. Joey Coleman: It's not just a catchy name, folks. Joey Coleman: It's supposed to be a reward. Dan Gingiss: Exactly, but if you make the experience so bad or so difficult, you might actually create the opposite effect, which is I'm going to go to the other gas station where this is just simply easier for me. And speaking of easy, I always say when in doubt, make it easy on the customer. So, you said "Hey, maybe there's a reason for three screens." And maybe there is, but that isn't the easy answer. The easy answer is the customer should just walk up to the screen, type in their phone number and be done. And so, when in doubt, make it easy for your customer. Joey Coleman: We're excited to give you an overview of an important book you should know about, as well as share some of our favorite passages as part of our next book report. 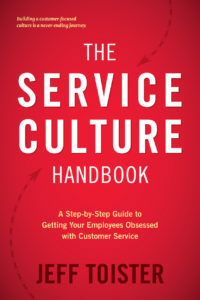 Dan Gingiss: Today's book is called The Service Culture Handbook by Jeff Toister, and this book came out in March of this year, so it's still pretty new. And I actually connected with Jeff, because this book came out about two weeks after my book came out, and so we shared some stories about publishing. And the subtitle of the book is a step to step guide to getting your employees obsessed with customer service. So, let's hear from the author himself, Jeff Toister, on what the book is about. Jeff Toister: Hi, I'm Jeff Toister, author of The Service Culture Handbook. This is a step by step guide to getting your employees obsessed with customer service. So, what does obsessed mean? Obsessed is really a sense of caring deeply about customers. Obsessed employees go the extra mile and they always seem to do the right thing. And this book is about showing organizations how to do that at scale. So, not just one employee, or two employees, but an entire company full of employees who are obsessed with providing the same type of customer service. The approach of the book is to profile successful customer focused companies and also incorporate practical steps that any organization or any team can follow. Now, one side note, I wrote the book without including Zappos, The Ritz-Carlton, Disney, etc, any of the usual suspects, and not to take away from those amazing companies, we've just heard their stories so many times before, so I've chosen a profile of companies that haven't been written about quite as much, such as Jetblue, REI, Publics, these are customer service leaders, but their story's perhaps a bit fresher. Now, the book itself is laid into three big parts, why do you need a customer focused culture? And how is that the key to outstanding customer service? Part two is how do you build that customer focused culture? And then part three is how do you change your organization to align everything around that customer focused culture? And the entire book is laid out as a step by step guide, so that you have the tools, the resources and information to take you on that journey, which truly is a never ending journey to building a customer focused culture. So, that's The Service Culture Handbook: A Step-by-Step Guide to Getting Your Employees Obsessed with Customer Service. Joey Coleman: I love the way this book focuses on culture. Jeff talks about having a culture of customer obsession, that leads to hero moments where employees get to play hero to the customer. I love that. I also love that he stresses the importance of having your own company culture. Man, I've seen this so many times where people try to borrow from another company's culture and it just doesn't work. He actually cites one executive in the book whose vision was to be like the Apple store, and then he talks to Ron Johnson, the creator of the Apple store, who ended up going to JCPenny and really struggling, and one might even say failing, to reproduce the magic that he had done with the Apple store, because it was a completely different company and culture. It's not a criticism of Ron, it's just when you roll into JCPennys, thinking that you're rolling into the Apple store, the brands don't align. They're two totally different experiences. Dan Gingiss: Yeah, I also really like the format of this book. It really is a step-by-step guide. So, when he says that in the subtitle, it's for real. And for each step, what Jeff does is he talks about both how to execute the step and what happens if you don't execute it, which I thought was a really neat way of doing it. Some of the things that he talks about, some of the steps like defining culture, engaging your employees, hiring and training the right employees, engaging them in company culture and empowering employees to live out that culture. And then also how it really does start at the top and how leadership can make or break the whole thing. So, let's get back to Jeff and have him share what his favorite passage is from the book. Jeff Toister: One restaurant chain wanted to create a customer focused culture, but it gave it's service too much to think about. There was a mission statement, an internal service slogan, a set of four service standards and a 17 step service procedure for serving every guest. All of these elements pointed to outstanding customer service, but each sentence was a slightly different message. These elements can be called cultural artifacts. A cultural artifact is any statement, symbol or physical item that helps define an organization's culture. A challenge occurs when an organization has multiple cultural artifacts that don't provide a single direction. The bevy of cultural artifacts at the restaurant chain created confusion for the servers. Should they focus on the mission which prioritized creating a great guest experience? Or should they follow their 17 step service procedure, which prioritized consistency and upselling? I was asked to give a presentation about developing a customer focused culture at the company's leadership retreat. The senior leadership team and the chain's store managers were all gathered in the room. I displayed a list of all of their cultural artifacts and asked "Which of these is the most important?" At first there was silence. Nobody knew the answer, because it was something they'd never talked about. And so that moment, these leaders had looked at each artifact individually, but never altogether. They suddenly realized why servers were frequently confused about the best way to serve their guests. The SEO fidgeted uncomfortably in his seat. It's not easy being leader when you're entire team suddenly sees a glaring blind spot in the corporate strategy, but once that blind spot comes to light, it's an important aspect of leadership courage to acknowledge and address the issue head on. The CEO turned to the group and asked them to weigh in on which of the cultural artifacts was the priority. As they talked, it became evident that the mission statement resonated most strongly with the leadership team. The group eventually determined that the statement should serve as the customer service vision. Emphasized over everything else. Dan Gingiss: You know, we have to be aware of how many rules and policies we give our employees. We have to show them the guard rails, of course, but we also need them to be their human selves. Joey Coleman: I totally agree with this, Dan. I must say one of my biggest pet peeves is when an employee says "Well Sir, you don't understand. It's our policy, so I can't be a human being and have a decent kind heart and help you in this horrid situation." They don't actually say that, but that's what I hear, right? I hear wah wah wah policy, wah wah wah, we don't care. [crosstalk 00:15:16] It's ridiculous. Dan Gingiss: It's a terrible excuse. So, Joey, what was your favorite passage from the book? Joey Coleman: My favorite passage was this one, and I'm quoting, "Companies that get really good at service will tell you they have to work at it every day." Absolutely love this quote. I think Jeff is spot on with it. You can't have a company offsite and say "We're going to care more about our customers and be better at service." And then that's it. You need to double down on this every day. I think it's like being healthy or committing to being a life long learner. It needs to be a daily commitment. It's going to require an investment of time and of money and of effort, and it's going to be ongoing. You're not going to just crank this out and say "Oh, we're done. We finished it out. It was our cue on goal was to be good at service and now that we are, we're all that." This really cuts across the entire organization. Everyone needs to be involved, regardless of, for lack of a better way of putting it, what level they're at at the company, whether they're customer focused and customer facing or not, they need to be thinking about the service that they're delivering and the experience they're creating, and they need to be thinking about this every single day. Dan Gingiss: Couldn't agree more. Dan Gingiss: I'm going to go a little bit different here. I'm actually going to read you, Joey, an entire chapter as my favorite passage, but bear with me here. Joey Coleman: Oh, wow. A whole chapter. Dan Gingiss: It's chapter 11 and it is called a customer focused example. And here I'm reading, "None of the customer focused companies profiled in The Service Culture Handbook wanted to be in chapter 11. It's understandable, given the connection in the United States between chapter 11 and bankruptcy or going out of business. He's not been using my customers, because they've helped me highlight the steps necessary to develop a customer service culture, so we'll just skip this chapter and go straight to chapter 12. I loved that. I thought that was absolutely brilliant. Joey Coleman: Oh my gosh, that's fantastic. Dan Gingiss: And I thought this was absolutely awesome. And it really goes to show, not only does Jeff have a sense of humor, but then, as you were just saying, he really does bring this into his every day. And I think that he was really demonstrating exactly what he's preaching in this book by think about your customer, think about what they would want. If nobody wants to be in chapter 11, then we're just going to skip chapter 11 and go to 12. So, I thought that was pretty cool. Joey Coleman: It's such a great moment of surprise and delight, too. You know, you're reading along in the book and then you come to this chapter and you're just going to laugh when you read that, right? Okay, it's quirky and it's weird, and the publisher may not have been too excited about it, but I love that Jeff has that in the book and he proves the point, which, how better to prove the point than to actually live it and to live it every day. That's brilliant. Brilliant. Well, I think overall that the key takeaways from this book are great customer service really does start with the corporate culture. It has to be ingrained. It has to be a daily practice. It has to be something that your entire organization is living and breathing on a regular basis. Number two, you need to take the time to define your culture and set specific goals around it. It's not enough to just say, and we've all heard, senior managers say "We need to have a good company culture. Quick, every body back to work." And it's like, okay, well you really need to define it and figure out what the goals are, and the measuring metrics for whether you actually have a good service culture or not. And then finally number three, you need to go find the right employees. You need to hire and train to your culture and empower people to deliver on it. I'm a big believer in you clearly outline your culture, you make that part of your hiring process, you let people know that they're being hired for their commitment to culture and that they could potentially be fired if they don't live the culture. And then you do regular training throughout their time as employees to make sure you're constantly doubling down into the importance of the culture. Dan Gingiss: Great takeaways, my man. And thank you to Jeff Toister for recording those little blurbs for us. We really appreciate it. Go out and purchase a copy of Jeff Toister's book, The Service Culture Handbook at Amazon.com or wherever you find fine books. And in it, you will find everything you need to design, develop and grow a commitment to customer service within your organization. Joey Coleman: There are so many great customer experience articles to read, but who has the time? We summarize them and offer clear takeaways you can implement starting tomorrow. Enjoy this segment of See Express, where we read the articles, so you don't need to! Dan Gingiss: Now you might want to hit pause for a moment and go pour yourself a little cocktail for this next segment, because this week's article is called what a nice scotch can teach you about experiential marketing. No, seriously, we'll wait. Go ahead. Joey Coleman: I'm glad that you have your own drink ready for this segment. Dan Gingiss: Alright, so this article is by John Hall. He's the CEO of Influence & Co, and this appeared on Forbes. And Hall says "You can't just tell customers how great your candles smell, or how comfy your mattress pad feels. Customers need to be able to interact with them in person to feel compelled to buy." Now, Hall focused on the alcoholic beverage industry, which has spent a lot of time in becoming really good at creating experiences as part of their marketing. And you've probably seen this, wineries, breweries, etc, distillers, are creating experiences out of tastings and turning them into must attend event. And once customers are there, the alcohol brands find that consumers are much more likely to buy if they can experience the products for themselves ahead of time. Joey Coleman: Absolutely. And in the interest of full disclosure, you selected this article, Dan, but John Hall's actually a good friend of mine. I'm actually a client of Influence & Co, his company. So, I absolutely love this article, because I think John is super smart. And what I loved about this article is, full disclosure, this is like the disclosure segment, you know, the lawyer in me, I can't help it. Secondary disclosure of Joey's, I actually don't drink alcohol, but what I loved about this article is he gives some really neat examples of creative things that alcohol brands are doing to stand out. I mean, let's be candid, the marketplace for alcohol is extremely crowded and getting more crowded with craft beers, craft scotches and all these micro brews and all these small batch whiskeys and things like that. So, creating a remarkable and memorable experience for your prospects and customers is getting more and more difficult, but what I love about John's article is he gives some great examples that are getting it done. Dan Gingiss: And by the way, full disclosure, I do drink this stuff. And I kind of like the small batch whisky. So, these are some fine examples here. Joey Coleman: Absolutely. The one that caught my attention the most is The Famous Grouse. They decided they were going to go for the Guinness Book of World Records and create the largest bottle of premium blended scotch in the history of the world. Now this is pretty crazy. To give you some context, the typical bottle of scotch is 750 milliliters, right? So, for those listening in the United States, I know this is a little confusing to you, but this is like a standard bottle of wine or a standard bottle of Scotch. They created a 200 liter bottle, and for those of you that don't want to do the math at home, that's basically the equivalent of 267 bottles of scotch in a single bottle. This bottle was enormous. It took three full hours to fill it. And when they were done, they displayed it at Scotland's most visited distillery, it's called the Glenturret. And visitors can see how they whiskey's made and also sample traditional Scottish whiskey, but they can also walk by this gigantic bottle of scotch, which is like a crazy little thing, but lots of times, or in this case, it's a crazy big thing, lots of times the crazy things that get your attention and create those memorable experiences and memorable moments. Joey Coleman: So true, so true. That's a long bus ride, a long bus ride. Dan Gingiss: It is. That's right. Definitely. So, the next example that he gave is one that I have experienced personally and I highly, highly recommend it. It's at Maker's Mark and Maker's Mark is out at Loretto, Kentucky, their distillery is. And you probably know that the bottle is known for its iconic wax dipping that is usually red at the top. Although, interestingly, and this is a side note, what they've started doing is they've started adding other colors to the wax. So, for example when my Cubs won the World Series last year, they had both a red and blue wax that they put on the bottom, on the bottle excuse me, because of the Cubs colors. Joey Coleman: Well, you got to the bottom of the bottle, so I understand why you just said that. Dan Gingiss: So, for visitors to the Kentucky distillery, they actually turned the wax dipping into a hands on experience. So, you get to go to the distillery, which is part of the bourbon trail, and you sample freshly made bourbon, and if you buy a bottle, they let you go over to the hot wax and dip your own bottle so that you create that wax seal. And then you obviously can purchase the bottle and bring it home. And I'd go a step further and say that when you become part of their ambassador program, they also allow you to create a personalized label that has your name on it, and to affix the label. So, it's really, really neat, and you can take home a bottle from your barrel. So, it's very, very personalized. And not only does this help boost sales at the distillery, but it creates this remarkable experience that people talk about and tell their friends about. And it turns these customers into lifelong brand loyalists, and I think it's awesome. I mean, I've done it. It was a ton of fun and it has definitely made me loyal to the brand. Joey Coleman: That's so cool. And what I love about this is they didn't create something new. This was already at the distillery, right? They already had the ability to wax dip these bottles. All they actually did is made their customers do the work, right? Which I think is a brilliant point of reference for anybody paying attention at home. There may be things in your business that you do, or like signature elements of your brand, that if you let your most loyal customers do it, now they literally have a physical and tangible connection to your brand. I love it. One of the other examples he gave is actually a Chicago brand, Koval. And I think what I loved about this story is Koval has really full on adopted the educational aspect of working with your customers. A lot of companies think about experiences and so they'll do a tour or maybe offer the opportunity to sample, but what Koval does is a little bit different, is they do cocktail classes and whiskey workshops. And basically, in the cocktail classes you learn bartending basics, you can sample some cocktails and learn about this history of alcoholic beverages. And then in the whiskey workshops, you can not only taste different types of whiskey of course, but you learn a little bit about the history of liquor in America. And what I love about this is, with your most loyal fans, they actually want to know all kinds of things about you and about your industry, that you may take for granted or may think of as "Why would anybody care about this?" But your loyal fans do. And what I thought was cool about Koval's approach is each sampling not only includes a couple of selections from their entire Koval's line, but it includes 10% discount on any spirits that you're going to purchase at the end of the class. So, you get to learn and take home a little drinkable memento of your time in the class. Dan Gingiss: Yeah and it makes people feel like they're a part of something. I mean, that's why they call it experiential, right? That they're having an experience with the brand, not just purchasing a bottle at a store, opening it at home, and drinking it in a glass. I think that these are all three really great examples that are all quite different, but obviously that they're in the same industry, and this is an industry that's figured it out. I mean, you walk into the grocery store or a liquor store, almost every time you walk in, there's somebody giving out samples, because these companies have figured out that, especially because many of these bottles are significant investments, that people aren't going to through that kind of money down unless they've tasted it and they know that they like it. I would say the other thing here is that most of the time, when you taste something in a special environment, it is going to taste better. Dan Gingiss: When you go to a winery, and this has happened to me right, you go to a winery and you taste this wine and it's like, "Oh, this is amazing." While you're sitting there staring at the vines on the grapes, or whatever. And then you bring it home, and you have the same bottle of wine and it isn't quite as good, because you don't have the atmosphere around it. So, they're very smart to bring that in to the experience. Shall we go to our takeaways? Joey Coleman: Let's do some takeaways. Dan Gingiss: Alright, well the first is that the more immersive that a brand can make the marketing experience, the more likely the customer is to remember it and buy, which of course is the whole goal of marketing. And so, I think the best marketing is when consumers don't know they're actually being marketed to. Joey Coleman: Absolutely. I think a second fantastic takeaway from this story is the customer experience starts before someone actually becomes a customer. It's all those interactions that they're having with you during the marketing process. And marketing really gives you the opportunity to set the expectations for what the future will be in your company, so take advantage of that opportunity. Dan Gingiss: Totally agree. And for our third takeaway, we're going to go to another quote from John Hall, which I absolutely loved. He says, "Some things must be seen, tasted, smelled, heard, or felt to be believed." 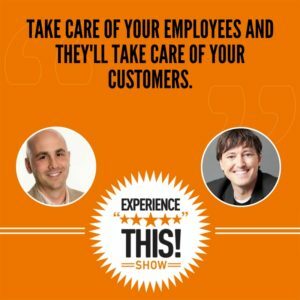 Joey Coleman: Listen in while we try to stump and surprise each other with a fantastic statistic from the worlds of customer experience and customer service. It's time to check out this number. Okay, Dan, this week's number is 61%. What do you think it means? Dan Gingiss: 61, 61. All I can think of is Roger Maris's home run record, which was 61. And he said it in 1961, but that's probably not it. Joey Coleman: Dan, my friend, you never cease to amaze me how you can insert random baseball statistics into our podcast. Dan Gingiss: It's what I do, Joey. Joey Coleman: Yeah, well, you do it well. You do it well. Actually, 61% is the percentage of employees that would rather start their own business, than work for someone else. This statistic comes to us from our sponsors Oracle CX Cloud and their new report sleepless over a customer experience, small business leaders, top sales and service concerns and how to fix them. Dan Gingiss: Well, first of all to Oracle CX Cloud for sponsoring our podcast. Joey Coleman: Woo-hoo! Oracle, thank you! Dan Gingiss: 61%, that's actually really high. And my first thought, besides that apparently a lot of people want to be small business owners, was that it seems like companies have some work to do when it comes to the employee experience, because you know when you work for the man and you work in a big company, the employee experience is really important, because it's what keeps employees happy and loyal to the company. And frankly, not thinking about leaving and starting their business. So, you've probably heard the refrain, happy employees equals happy customers, and it's definitely true. If you have people working for a company and they love the brand and they love working there, that's going to be translated in to how they communicate to customers and they will be more out to make customers happy. Joey Coleman: Totally agree. Take care of your employees, they'll take care of your customers and they'll take care of the senior management team and owners. To find out more, go to oracle.com/increport, that's I N C report, and if you give your email address, you can get the full report. Thanks so much to Oracle CX Cloud for your continued sponsorship of the Experience This! Show.